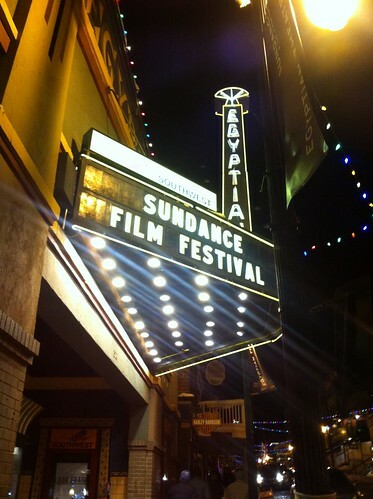 Amanda and Max were lucky enough to make it out to the Sundance Film Festival and talk about what it is really like. Max Naylor: Hi everybody. I’d like you to meet Amanda. She's a programmer from an independent film festival in Southern California, and she was lucky enough to be able to attend the Sundance Film Festival this year. Amanda Salazar: Thanks Max, that is such a kind introduction. Max is also a festival programmer and he has one of those faces that everybody says 'I think I know him' when you bring up his name. So, Max, what are your basic thoughts on Sundance? MN: My main goal at Sundance is to see as many films as possible, and try to keep the late-night events and partying from having too much of an affect on the running total. You? AS: For me Sundance is synonymous with independent cinema and the films come first. But after my first trek to Sundance a few years ago I found out that that is not always the case. Sure, our focus is on the films but there is a world that functions outside, around, and on top of these films that exists. MN: It's arguably the most prestigious independent film festival in the world; everyone has heard of Sundance. I know, when I was a young boy being told that you couldn't make a living watching movies all the time, I had an idea in my mind of what Sundance would be like. However, when I finally started making a living watching movies all the time and was able to actually attend, and I mean this in no negative way, that image was completely shattered. AS: Absolutely, I completely agree. There is a whole separate experience from the films that most people don’t even know about. MN: And there’s a huge glut of reviews, tweets, blog posts, and articles pouring out of Park City, covering every conceivable aspect of the program. So, instead of adding to that stream of content, let’s talk about our personal perspectives of being up here. AS: Sundance is all about the movies. From eight in the morning to the midnight slot, people are lining up to see the films that have been programmed, it is what everyone is talking about. We spend all day watching movies and yet I think that I didn’t see enough. I don’t have a final tally but I am sure that both of us screened over 25 films in the week. But we also have a different perspective being that we are in the Press & Industry (P&I) screenings which are completely different than the public ones. MN: Packed with industry professionals and press, the P&I screenings are hotbeds of festival chatter. Sitting in the theater, waiting for the screening to start, the consistently and superfluously loud voices of the Hollywood set echo across the room. I was privy to every personal conversation, every opinion and criticism. I'm constantly amazed at how much you can learn by simply sitting quietly in the theater and hearing the titans of the industry scream to the person sitting directly next to them about how they were snubbed by Jeremy Piven the night before, or how they're not going to pick up a film for distribution because it wasn't "naked enough." AS: And see, for me I found out so much about people as we waited in line to be let into the theater. I mean we were having to queue up at least an hour before each show to make sure that we got a seat. I ended up talking so many people involved in the industry, like programmers, distributors, and critics I don’t think I can keep up with the amount of business cards I was given. MN: I didn’t get nearly as many cards. I think that’s the advantage of being an attractive woman. AS: How can you even tell anyone is attractive with all of the layers we have to wear? MN: I manage. Being a native Californian, I struggle with all this winter clothing that I find neither simple nor familiar. I’m wrestling with coats and gloves, running out into the dim mornings, trying to get to these early, early screenings. Earlier than my job. Earlier than church. Personally, I never wake up in single digits, but here I’m scrambling out the door so I can get to a 9 a.m. screening of a movie I know nothing about beyond a blurb in the program and maybe a trailer I could find online. And that's the largest, and arguably most enjoyable, part of my day; watching these often astounding films debut in front of people who can really get these artists out there, to help their voices be heard. Sundance is about as corporate as you can get while still being able to call itself "independent," but these filmmakers are the people, year after year, that are going to be responsible for the development of film as an art form. Independent film is the arena where the film medium is advanced and it's thrilling to watch it unfold in front of you at what is possibly the most influential festival of the year. AS: And that is exactly the reputation Sundance has. What they don't tell you about Sundance is that you spend so much time scheduling your day, then waiting in line, then running to catch the bus to make an event to then getting back into the theater that you don't really get to eat or sleep; that’s not a part of the agenda. You quickly get used to the fatigued, anxious, starving, and running on coffee feeling. I would say that the only real meals that I ate were breakfast before I left the condo. It is actually pretty surprising how far you can get by on pieces of cheese and Stella Artois and it helps that it is all free. MN: And of course part of all that rushing around comes from the fact that the P&I screenings all take place at the Holiday Theater cineplex, while all of the events happen on Main Street and the public screenings are scattered at different theaters throughout the city. In order to hit all the venues, you’re shuttle-jumping every few hours. Even though the locations aren’t actually that distant from each other, there’s no way you can trek through all this snow. AS: Oh! And the buses are another great place to meet people. Everyone there is either coming or going from films, events, skiing, or drunk so it makes for great conversation or sing-a-longs. I always find that I meet most of the filmmakers on buses as they basically come out here on their own dime and need to travel like everyone else. They don’t even get into most of the parties. MN: Exactly. Being out at the festival is one of the ways you make those personal connections that are kind of the currency of the film industry. There was at least one time this year I was sardined onto a bus and I was forced to either try and talk to the person I was pressed against or start making out with him in order to avoid the awkwardness. They turned out to be filmmakers with a movie I wasn’t planning on seeing, but after we were close-talking for a fifteen minute bus ride we’d made a connection. Schmoozing's important. In a lot of ways, movies run on money and connections. Skill and artistry don't always make the top three necessities in filmmaking and those chance meetings and new relationships that consistently and unexpectedly spring up around Sundance are an intrinsic part of the festival experience. AS: My advice is to track down and befriend a filmmaker. Be on the lookout for that certain badge around their necks that distinguishes them. Their approach to Sundance is completely different than that of the industry folks like myself. They are the blood that pumps through this Festival and their spirit and honesty about it is unmatched. They are not tainted by everything else that embodies Sundance. Their films screen at least six times to packed crowds, they get great coverage on their film, and have brunch with Redford. Not only are they simply excited to be out here showing there film to an enthusiastic audience but they are the most willing to grab drinks at dirty bars to discuss future project afterwards. MN: Especially if you happen to be an attractive woman. AS: You are a big jerk. MN: So! Once you’re done being hit on by filmmakers, my advice is to get out to Main Street and try to track down a party. They are always great events, great opportunities to meet people, and once the drinks start flowing (which, inevitably, they do), it’s an almost necessary way to unwind after being cooped up in the theater screening all day. AS: But don’t you find it interesting that sometimes even the filmmakers can’t get into the parties? They have the most important badge at the Festival (besides the Sundance staff and volunteers that is) that they should get into everything. It is such a closed-door, elite world that exists on Main Street that is completely separate from the rest of the Festival. MN: Before I came here, I assumed the filmmakers walked around this town like kings. They are, after all, why the festival exists. Now I know that there are filmmakers who never go to a single industry party, and there are people who attend the festival who never go to a single film. It’s bizarre what a cross-section of people you get attending, with such disparate intentions. But even if they can’t get into parties, they’re always the most interesting people to talk to. AS: Lists are everything here and it doesn't matter who you are but who you know. I learned a little trick in previous years where all you have to do is lie and insist that you are on the list (and I happen to know a few people that I can name drop). But you must say it with conviction, any faltering will result in failure. MN: Of course, that doesn’t always work out. I was having dinner in a bar that had started charging a cover to get in after I’d already sat down, and when you tried to meet me they wouldn’t let you in without paying. So, of course, you insisted you were on a list, making the bouncer check three separate times, on a list that didn’t, in fact, exist. Nice one. AS: I was pretty impressed with myself. So we have covered Industry, the films, buses, winter-wear, embarrassing moments, and even the parties. Anything else? MN: I think the only thing left is to say what everyone already suspects: that Sundance is an amazing, unique experience, and anyone even remotely involved in film, anyone who shares a modicum of the passion towards film as sycophants like us have, should make it out here at least once before they’re dead. MN: Hey, Amanda, thanks for doing this with me. I think you’re great. AS: And I think that you are the most beautiful woman in the world.